League honours still eluded Eire Og, finishing 3rd in 2000 and 2nd by a point in 2001, but in 2001 the Ogs won the Junior Football Championship, beating O�Neill Crowleys, Mitchell�s, Ballycastle and St Malachy�s on the way. The Under 17 side became Sevens Football Champions too that year. Provincial competition followed, as Eire Og were quarter-finalists in the Ulster Junior Club Championship, before bowing out to Newry Mitchell�s from Down. Read about the 2001 JFC success by clicking here. Neil Ryan filled the vacant captaincy in 2002, the same year in which Eire Og were beaten finalists in the Martin Cup. Having squeezed past McCracken�s in the first round, it took a replay against a good Gort na Mona team, before succumbing to a strong St Agnes team in the decider at Corrigan Park. The senior football team reached the promotion play offs for Division 2 but lost heavily to St Gall�s. Pat Rice stepped down from the senior manager�s post and, after some months in limbo Sean O�Neill and Conor Muldoon became joint managers. 2003 saw the Ogs in mid table, but the following year Eire Og had slipped into the relegation zone. Despite good wins against some of the stronger sides and a decent performance in the Intermediate Championship, the Ogs struggled to find any consistent form and did not fare as well as they should have against teams they should have beaten. The relegation play off against Aghagllon was won very convincingly indeed which asked the question, "Why were we there in the first place?". The senior footballers' form seemed to be contagious as the South Antrim team also struggled. At underage level 2002 saw success for our Under 8 team in the Locus Management Football Blitz competition and the following year in 2003 the Under 10 footballers won the Aldergrove Football Blitz tournament. Eire Og hosted a very successful indoor winter hurling league in 2004 and are building on their already impressive underage development scheme. 2004 saw the Under 12 footballers win their league convincingly and reached the final of the Lamh Dhearg tournament only to lose to the hosts. The Under 9 footballers won the Carryduff Tournament also in 2004. 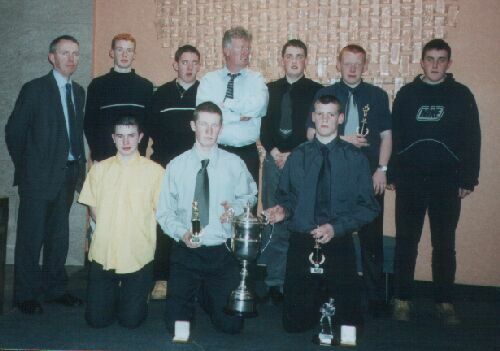 As well as the Under 17 Sevens Football Championship in 2001, Eire Og has had several inter-county juvenile players. Colm McAuley and Peter Elliott were Minor footballers in 2003 and were followed by Ciaran Ryan in 2004. At Under 16 level the Ogs had Declan Rice in the County hurling development squad. Hurling was encouraged more during the early part of the 2000's, partly due to the club losing good young hurlers to other teams when the Ogs couldn't offer them any teams. Minor All County hurling returned to the club for the first time in many, many years as an amalgamation of Eire Og, St Teresa's and St Agnes fielded as Naomh Nua in 2004. The following year 2005 saw Eire Og enter a senior hurling team in the All County Division 4, comprising a mixture of young minor hurlers, old experienced hurlers and footballers who hadn't hurled in years.